The Daily GRRR! HEADLINES for Dec. 30, 2014. 1. Train derailment in Banff Nat’l Park spills ash and grain into creek. 2. Massive B.C. gold mine near Alaska border gets environmental approval. 3. Canada votes against UN ban on nuclear weapons in the Middle East. 4. SumOfUs.org is taking votes for the first annual Corporate Evil Awards! 5. “Clogged Arteries” album raises funds for frontline pipeline resistance. 6. KW Poetry Slam brings spoken word back to the Boathouse on Jan. 3! Welcome back to SoundFM! You are now listening to The Daily GRRR! heard on the airwaves at 100.3fm, CKMS in Waterloo, Ontario, and SoundFM.ca on the web. This is Kathryn and I’ll be your host on this Tuesday morning show for December 30, 2014. 4. SumOfUs.org is taking votes for the first annual Corporate Evil Awards! 6. KW Poetry Slam brings spoken word back to the Boathouse on Jan. 3! 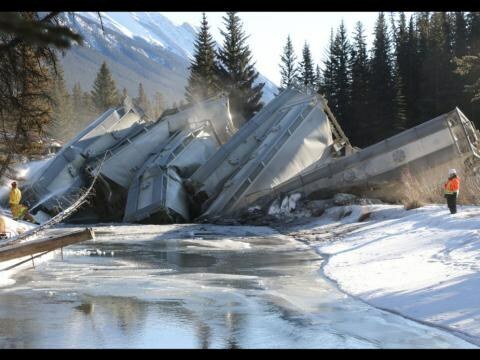 As reported by The Calgary Herald, crews were scrambling on Friday to clean up the scene of the latest train derailment that spilled ash and grain into a Banff creek and caused the water to become cloudy just upstream from the Bow River. Fifteen Canadian Pacific cars loaded with lentils and fly ash — a component of cement and a byproduct of coal-fired plants — fell off the tracks on a bridge crossing over 40 Mile Creek near Banff townsite at 2 a.m. Friday. “The bridge is a wreck,” said John Cottreau, a spokesman for the Transportation Safety Board, which is investigating the crash. The derailment on Canadian Pacific’s main line through Banff National Park has reignited concerns about railway safety and the speeds at which trains travel through sensitive habitats. The spilled ash and grain each pose their own potential problems for wildlife, including the attraction of bears to unsafe territory. Alberta Environment, which has dispatched crews to the scene to help make sure the site is properly cleaned, said its greatest concern is the fly ash, which can create sedimentation problems and decrease acidity levels. The impact that the spill will have on fish in the creek will depend on the amount of ash that was spilled, which has not yet been determined. This crash is also drawing renewed criticism to the dangers of rail transport for these, as well as far more dangerous, commodities. Canadian Pacific said 22 to 27 trains travel through the affected area in a 24 hour period, sometimes carrying petroleum products and other dangerous materials that would have had an even more serious impact on the ecosystem if they had been on board the derailed train in this case. As reported by CanadaTalksIsraelPalestine.ca, “On December 2nd, the UN General Assembly approved a resolution (161- 6) calling for a ban on nuclear weapons in the Middle East. Only six countries opposed the resolution, including Israel, the U.S., and Canada. Harper and Baird have repeatedly made a point of saying that they do not intend to “go along, to get along” in order to stand on principle. But this is a doozy. It is hard to detect the principle underlying opposition to a nuclear weapons ban in the Middle East. Unless, of course, the principle is to support Israel no matter what it does. The resolution was introduced by Egypt, which has pushed for the establishment of a nuclear weapons-free zone in the Middle East and lamented that US-backed efforts to convene talks were abandoned in 2012. Israel is the only Middle Eastern country that is not party to the Treaty on the Non-Proliferation of Nuclear Weapons. Experts estimate that Israel has over 80 nuclear bombs. The resolution also called on Israel to put its nuclear facilities under the safeguard of the UN’s International Atomic Energy Agency. Ironically, Iran, which Mr. Netanyahu has been criticizing for its nuclear program, voted in favour of the resolution, and indicated that it approves of putting its nuclear facilities under the UN’s supervision. Is is estimated that the United States and Israel have more nuclear bombs than the rest of the world combined. To support them, Canada voted against more than 90% of the world’s population. That must be a new record in neither going along nor getting along.” So much for any stereotype that Canadians are polite, at least when it comes to foreign policy. Their list of contenders include the following front-runners: “Chevron's three decades of oil drilling in the Ecuadorian Amazon saw the oil giant dump over 18 billion gallons of toxic wastewater into pristine rainforest -- but the company refuses to pay up the $9.5 billion it owes affected communities.” Meanwhile, “Nestlé has done everything from draining drinking water in Pakistani villages to using child slavery to make chocolate. Then its CEO had the gall to claim water was not a human right.” Then there’s Suncor, “the most profitable company in Canada’s tar sands, the largest industrial project on the planet. The company is wreaking havoc on First Nations communities, causing rare cancers and making animals sick.” PepsiCo, Bayer, and Monsanto are also in the race, so if clicktivism is your thing, there are still a few days left to cast your vote for the SunOfUs.org Corporate Evil Awards. Released on November 24th of this year, "Clogged Arteries: Songs and Spoken Word in Support of Front-line Pipeline Resistance" is a compilation CD featuring 18 tracks from 18 different artists spanning a huge range of musical styles. In response to proposed projects to increase the flow of tar sands oil and fracked gas to the west coast of Turtle Island, artists on the compilation address the blatant disregard for communities, ecosystems and democracy, for the sake of profit and power. They show many sides of the human response to the threat of these projects, such as the Enbridge Northern Gateway Project, the Kinder Morgan Trans Mountain Expansion Project, the Pacific Trails Pipeline, and the tar sands themselves. The songs call for support for the struggles of original inhabitants on unceded lands, and for action in response to injustices. All funds raised will be donated to front-line pipeline resistance on northwestern Turtle Island. Funds will be rolling in over time, as the CD gets out there through various physical and online outlets. As they come in we'll be making a judgement call based on where they seem most needed at the time, and most effective given the quantity. This information will be posted at www.cloggedarteries.bandcamp.com. Recipients will be where people are standing up on the ground in defense of land and communities, including the Unist'ot'en Camp. The first slam of 2015 will be raising the roof at the newly re-opened Victoria Park Boathouse on Saturday, January 3rd. Doors and poet sign ups will start at 7pm, with the open mic beginning at 7:30pm and the official slam beginning at 8:00pm sharp. The cost is $5 or pay what you can, so don’t let the price stop you if you’re ringing in the new year on a tight budget. All ages are welcome, though the material presented on stage may contain mature content, so parental discretion is advised. KWPS strives to be a welcoming space for everyone, including our queer and trans friends. We’re also pleased to say that the Boathouse is a physically accessible space, with the interior space and washrooms both wheelchair accessible. If you have any access needs or questions, KWPS would be happy to hear from you by email (kwpoetryslam@gmail.com). The KW Poetry Slam will also be hosting a feature poet for the slam, as well as a free workshop the next day. LADY SIN TRAYDA, born RYAN KAI CHENG THOM, aka CHINA ROSE is a fiery writer, performer, spoken word artist and drag-dance sensation. A little Chinese grrl with a big, lipsticked mouth, her words pack a revolutionary punch that takes the fight right to the heart of expectation, stereotyping, and all kinds of oppression. Lady Sin and her alter-egos have traveled across Canada to bring poetic performances to pages and stages from her hometown of Vancouver to her current haunts in Montreal. She has featured at such venues as the Vancouver Poetry Slam, the Throw Poetry Collective, Montreal’s Radical Queer Semaine, and the Canadian Festival of Spoken Word, competing as a finalist at the Verses International Poetry Festival 2012. With her eyes on the horizon and her feet in the glorious, star-strewn gutter of her roots, Lady Sin Trayda is always on the lookout for new vistas of performance, and new boundaries to push. She’s also sticking around to facilitate a free workshop the next day, under the headline “Giving Birth To Yourself: Revolutionary Storytelling Workshop”. We’ve linked to both events on the podcast page for today’s show, and we hope to see you there in the new year!